I'm not just a complete sucker for port-like fortified wine; I'm also a sucker for rosé. Of course I've had rosé that weren't as good as others but I've never had one I didn't like. There's just something about rosé that's got me. So it's about time I reviewed one, huh? Charles Smith is one of the more fascinating winemakers in the world today. He's got long, blonde frizzy hair that will remind you of both Sammy Hagar and Sideshow Bob at once. The guy came from Sacremento, California and worked in restaurants until he moved to Denmark to manage bands during the '90's. He came back to the USA in 1999 and found himself in Washington State. His love of wine from his restaurant days was reignited while passing through Wall Walla and soon he was buying grapes and delivering his wine to retailers in a van that wasn't suitable for driving to his own mailbox. 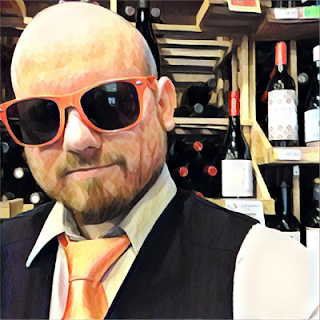 Now he's a rock star in winemaking and completely down to earth when it comes to marketing, labeling and pricing of his wine. Charles Smith makes highly acclaimed high-end wine under his K label, and his Charles & Charles label has wines that far exceed their inexpensive price point. The Velvet Devil Merlot is tasty as hell (get it?) and the Post 35 Red Blend is RIDICULOUS for $11. But I have to admit as a Riesling lover, even though it was one of the Top 100 Wines of 2014 by Wine Spectator, I'm not a fan of Kung Fu Girl Riesling. Ah well, to each his own. 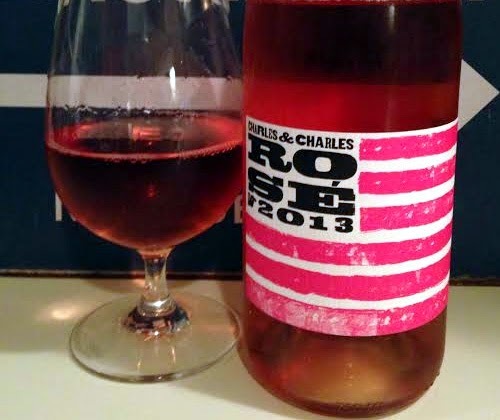 I'm about to see how I feel about the Charles & Charles 2013 Rosé. Like all of Charles Smith's wines the label is hand-drawn. It's a pink, white and black American flag, with black letters as the stars and poorly painted pink lines as the stripes. Brilliant label as always from this guy. I should add that every case comes with a bumper sticker that reads "YOU CAN DRINK ROSÉ AND STILL BE A BAD*SS". Now that's badass. The back label says the blend is 86% Syrah, 6% Cinsault, 4% Grenache, 2% Counoise and 2% Mourvedre. It has an alcohol strength of 12.8% ABV. What a gorgeous, vibrant color this wine is. A little purplish-pink and a little orange. It's like if tuna sashimi and salmon sashimi made whoopie and had a sashimi baby. Tulmona is what I'm going to call this color from now on. Adjust. The dominant aroma on the nose is minerality. Past that there's pink lemonade and the faint smell of lemon pepper. It's a pretty quiet nose, though. It's got a heavy, rounded body and even feels a bit oily to me. The acidity is shockingly almost absent. The palate is herbal and there's a strawberry flavor... but it's the white ends on the inside of a strawberry, not the juicy ripe part. This wine tastes kind of like if you cut off the top quarter of a strawberry, greens included, and ate it. But take the intensity of the foliage down to just detection level. While you're at it, take the strawberry down too. The body is big but the flavor is, for the lack of a better term, watered down. My favorite characteristic of rosé wine in general doesn't show up until the finish: watermelon hard candy. And it's a juicy watermelon hard candy too, if a hard candy can also be juicy. Cantaloupe introduces itself on the finish, the lemon pepper from the nose returns, and it's also where the acidity finally kicks in. The finish is the most complex and interesting part of the wine. And just to clarify: I have no problem with that. Towards the end of my drinking session I thought to myself "this would be really good with Lays Classic potato chips!" so here's a bit of advice from experience... don't do that. The saltiness of the chips make the wine taste bitter. Just a heads up. For $12 a bottle this rosé is satisfying and totally worth the price of admission but it's not going to romance you. It's too laid back for that. This is a rosé that you chill well, have friends over for some grub, slap the bottle down in the middle of the table, and go to town on it while you talk about whatever you social people talk about. The bottle used was purchased by myself for the purpose of this review. What I've got going for me. Say "Connoisseur" ONE MORE TIME!